Tommy Johnson Jr. drove to the Funny Car pole in North Carolina. Tommy Johnson Jr. continued his postseason qualifying prowess Saturday at zMAX Dragway, powering to the Funny Car pole as time trials concluded for the 11th annual NHRA Carolina Nationals presented by WIX Filters in Concord, N.C.
Brittany Force (Top Fuel), Drew Skillman (Pro Stock) and Eddie Krawiec (Pro Stock Motorcycle) also secured No. 1 positions in their respective categories at the fourth of six playoff events during the 2018 NHRA Mello Yello Drag Racing Series Countdown to the Championship. Johnson, still looking for his first win of 2018, claimed his second straight No. 1 qualifier and the 17th of his career after covering the 1,000-foot distance in 3.873-seconds at 329.10 mph in his Charger R/T during Saturday’s final session. That run set up a first-round match with Dave Richards and his Ford Mustang for Johnson, who entered the weekend fourth in the standings. DSR teammate Ron Capps, the 2016 world champion, finished second in qualifying with a 3.875-second pass at 329.42 mph in his Charger and will race Dale Creasy Jr. to open eliminations. Point-leader Robert Hight, the two-time/reigning world champ who has two straight Countdown wins, qualified seventh in his Chevrolet Camaro SS at 3.911-seconds and 330.31 mph. 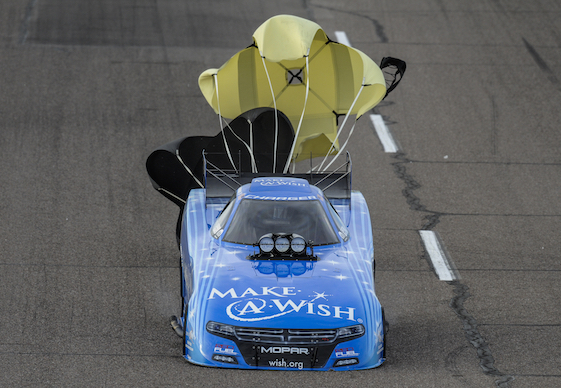 Hight, of John Force Racing, will meet 2012 world champ “Fast” Jack Beckman of DSR and his Charger in the first round. Brittany Force, the reigning Top Fuel world champion, picked up her second pole of 2018 and 10th of her career with a 1,000-foot run of 3.700-seconds at 330.72 mph in the final session. The run, which gave Force the pole at both races at zMAX Dragway this season, set up a first-round match with Audrey Worm as Force looks to pick up her second win of 2018. Point-leader Steve Torrence, Friday’s provisional No. 1 who has won the first three events of the Countdown, will start eliminations from the No. 2 position after his pass of 3.704-seconds at 331.53 mph in the Torrence Racing dragster. An eight-time winner this season, Torrence will meet veteran independent campaigner Chris “The Greek” Karamesines in the first round. Championship runner-up Clay Millican qualified third after his pass of 3.718 at 321.73, setting up a first-round race against Kyle Wurtzel. Pro Stock’s Skillman earned his seventh career pole and second in 2018 after his quarter-mile run of 6.509-seconds at 211.30 mph during the final session in his Chevrolet Camaro SS. Skillman, seeking his first win of 2018, will try to become the 10th different Pro Stock winner this season. Skillman will race Shane Tucker and his Camaro to open eliminations. Provisional top qualifier and two-time world champion Erica Enders finished second with a run of 6.513-seconds at 211.96 mph in her Elite Motorsports Camaro. She will race Wally Stroupe and his Camaro in the first round. Point-leader Tanner Gray, who has seven wins in 2018, qualified third at 6.516 and 212.33 in his Camaro, setting up a first-round match with Allen Prusiensky and his Dodge Dart. Krawiec, the four-time/reigning world champion, collected his fourth No. 1 qualifier of 2018 and 43rd of his career with a quarter-mile pass of 6.806-seconds at 197.83 mph from Friday aboard his Screamin’ Eagle Vance & Hines Harley-Davidson Street Rod. Krawiec, who trailed point-leader and 2010 world champ LE Tonglet by 47 points heading into the weekend, faces Jim Underdahl and his Suzuki in the first round. Ellis stayed second after improving to 6.806-seconds at 196.85 mph aboard his Harley-Davidson, setting up a first-round matchup with Joey Gladstone and his Buell. Point-leader Tonglet qualified ninth at 6.856 and 195.90 aboard his Nitro Fish Racing.com Suzuki and will race three-time world champion Angelle Sampey and her MSR Buell to open eliminations. FOX Sports 1’s coverage will begin with a one-hour qualifying recap on “NHRA Sunday Nitro” at 1 p.m. (EDT), followed by three hours of live final eliminations at 2 p.m.
Top Fuel _ 1. Brittany Force, 3.700-seconds, 330.72 mph vs. 16. Audrey Worm, 4.057, 266.11; 2. Steve Torrence, 3.704, 331.53 vs. 15. Chris Karamesines, 3.992, 282.66; 3. Clay Millican, 3.718, 321.73 vs. 14. Kyle Wurtzel, 3.901, 291.82; 4. Mike Salinas, 3.720, 329.02 vs. 13. Pat Dakin, 3.859, 312.57; 5. Doug Kalitta, 3.727, 327.59 vs. 12. Scott Palmer, 3.788, 326.56; 6. Tony Schumacher, 3.732, 329.42 vs. 11. Antron Brown, 3.785, 326.40; 7. Leah Pritchett, 3.755, 322.04 vs. 10. Richie Crampton, 3.774, 318.99; 8. Dom Lagana, 3.762, 324.59 vs. 9. Terry McMillen, 3.769, 325.30. Did Not Qualify _17. Lex Joon, 4.356, 178.19. Funny Car _ 1. Tommy Johnson Jr., Dodge Charger, 3.873, 329.10 vs. 16. Dave Richards, Ford Mustang, 4.248, 272.94; 2. Ron Capps, Charger, 3.875, 329.42 vs. 15. Dale Creasy Jr., Dodge Stratus, 4.181, 301.87; 3. Tim Wilkerson, Mustang, 3.876, 323.74 vs. 14. Jim Campbell, Charger, 4.035, 309.42; 4. J.R. Todd, Toyota Camry, 3.894, 327.90 vs. 13. Jonnie Lindberg, Mustang, 3.959, 323.19; 5. Cruz Pedregon, Camry, 3.901, 325.77 vs. 12. Courtney Force, Chevy Camaro, 3.945, 308.50; 6. Matt Hagan, Charger, 3.903, 325.14 vs. 11. Shawn Langdon, Camry, 3.937, 318.02; 7. Robert Hight, Camaro, 3.911, 330.31 vs. 10. Jack Beckman, Charger, 3.929, 325.45; 8. John Force, Camaro, 3.914, 330.72 vs. 9. Bob Tasca III, Mustang, 3.920, 323.58. Did Not Qualify_ 17. Bob Gilbertson, 4.301, 250.88. Pro Stock _ 1. Drew Skillman, Chevy Camaro, 6.509, 211.30 vs. 14. Shane Tucker, Camaro, 6.733, 204.35; 2. Erica Enders, Camaro, 6.513, 211.96 vs. 13. Wally Stroupe, Camaro, 6.708, 206.01; 3. Tanner Gray, Camaro, 6.516, 212.33 vs. 12. Alan Prusiensky, Dodge Dart, 6.608, 209.72; 4. Jeg Coughlin Jr., Camaro, 6.522, 211.69 vs. 11. Fernando Cuadra, Camaro, 6.568, 210.34; 5. Jason Line, Camaro, 6.523, 211.59 vs. 10. Bo Butner, Camaro, 6.556, 211.56; 6. Alex Laughlin, Camaro, 6.525,211.03 vs. 9. Deric Kramer, Camaro, 6.550, 211.03; 7. Greg Anderson, Camaro, 6.531, 211.93 vs. 8. Vincent Nobile, Camaro, 6.545, 211.66. Pro Stock Motorcycle _1. Eddie Krawiec, Harley-Davidson, 6.806, 197.83 vs. 16. Jim Underdahl, Suzuki, 6.905, 195.11; 2. Chip Ellis, Harley-Davidson, 6.806, 196.90 vs. 15. Joey Gladstone, Buell, 6.903, 194.30; 3. Jerry Savoie, Suzuki, 6.819, 195.99 vs. 14. Steve Johnson, Suzuki, 6.891, 194.27; 4. Matt Smith, EBR, 6.836, 197.71 vs. 13. Karen Stoffer, Suzuki, 6.884, 194.30; 5. Hector Arana Jr., EBR, 6.838, 199.29 vs. 12. Scotty Pollacheck, Suzuki, 6.879, 195.03; 6. Andrew Hines, Harley-Davidson, 6.842, 196.70 vs. 11. Hector Arana, EBR, 6.876, 197.33; 7. Angie Smith, Buell, 6.852, 194.32 vs. 10. Ryan Oehler, Buell, 6.875, 196.53; 8. Angelle Sampey, Buell, 6.853, 195.00 vs. 9. LE Tonglet, Suzuki, 6.856, 196.33. Did Not Qualify _ 17. Ron Tornow, 6.908, 193.43; 18. Kelly Clontz, 6.925, 192.38; 19. John Hall, 6.929, 194.16; 20. Mark Paquette, 6.935, 192.00; 21. Anthony Vanetti, 7.101, 185.92; 22. Maurice Allen, 7.110, 188.04. Rick Hord secured the No. 1 qualifying position Saturday during the E3 Spark Plugs NHRA Pro Mod Drag Racing Series presented by J&A Service portion of the NHRA Carolina Nationals presented by WIX Filters. This weekend’s Pro Mod event, presented by Mr. Race Oil, is the 11th of 12 races during the 2018 season. Hord’s quarter-mile pass of 5.681-seconds at 258.67 mph in his turbocharged 2016 Chevy Corvette is the second-quickest pass in class history and earned his second career No. 1 qualifier. Seeking his first Pro Mod Drag Racing Series victory, Hord will open eliminations against Bob Rahaim and his Chevy Camaro in what ended up as the quickest qualifying field in class history. Jeremy Ray, who won last Sunday’s event at Texas Motorplex in Ennis and was the provisional No. 1 qualifier Friday, is second after his run of 5.683-seconds at 251.91 mph in his 1963 split-window Corvette via the third-quickest run in class history. Ray will meet Chip King and his Dodge Daytona in the opening round. Point- leader Mike Janis qualified seventh in his ’69 Camaro at 5.715 and 249.03 to set up a first-round matchup with Stevie Jackson and his Camaro. Pro Modified _ 1. Rick Hord, Chevy Corvette, 5.681, 258.67 vs. 16. Bob Rahaim, Chevy Camaro, 5.769, 249.49; 2. Jeremy Ray, Corvette, 5.683, 251.91 vs. 15. Chip King, Dodge Daytona, 5.762, 251.20; 3. Sidnei Frigo, Camaro, 5.701, 258.07 vs. 14. Khalid alBalooshi, Camaro, 5.759, 251.91; 4. Steven Whiteley, Camaro, 5.708, 255.58 vs. 13. Todd Tutterow, Camaro, 5.757, 249.58; 5. Mike Castellana, Camaro, 5.708, 252.61 vs. 12. Michael Biehle, Ford Mustang, 5.757, 257.78; 6. Rickie Smith, Camaro, 5.711, 251.77 vs. 11. Danny Rowe, Camaro, 5.750, 253.99; 7. Mike Janis, Camaro, 5.715, 249.03 vs. 10. Steve Jackson, Camaro, 5.738, 247.84; 8. Justin Bond, Pontiac Firebird, 5.718, 258.52 vs. 9. Chad Green, Corvette, 5.728, 250.64. Did Not Qualify _ 17. Brandon Snider, 5.772, 247.84; 18. Doug Winters, 5.798, 242.98; 19. Steve Matusek, 5.803, 251.72; 20. Jader Krolow, 5.825, 255.05; 21. Clint Satterfield, 5.859, 250.92; 22. Pete Farber, 5.924, 244.56.